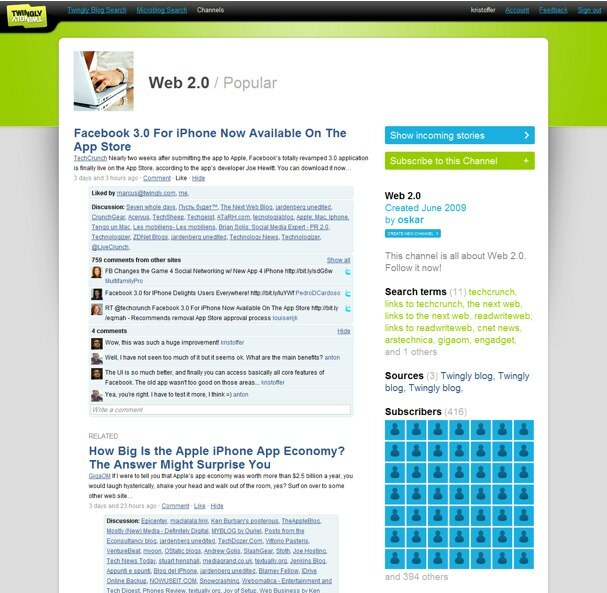 As we wrote previously, Twingly is a mix between Digg and FriendFeed. Twingly Channels lets users to create their own personalized social memetracker by collecting feeds and search terms covering any topic or event into a channel they share with others. And the site has real-time functionality. Users can post links posted by users, content from RSS feeds, and real-time search results for terms from blogs and microblogs (i.e. Twitter). The resulting stream is filtered into a Friendfeed-like channel where people can comment on, like, or dislike incoming items. Channels will be public by default, but to comment or subscribe you will need to sign up. Twingly will also employ a ranking system to filter content using a proprietary alogorithm. Every item coming into the channel is continuously ranked using links from blogs, Tweets, user comments and likes. The highest ranked items are shown in the Popular view. Twingly Channels can also be used by companies for brand tracking and social media monitoring and can be kept private for these purposes. The site could be useful for aggregating RSS feeds, tracking specific content on blogs and microblogs and then sharing that content with others, all on one site. The blog/microblog search is powered by Twingly’s search engine which tracks close to 26 million blogs around the world. It’s similar in some ways to Streamy.